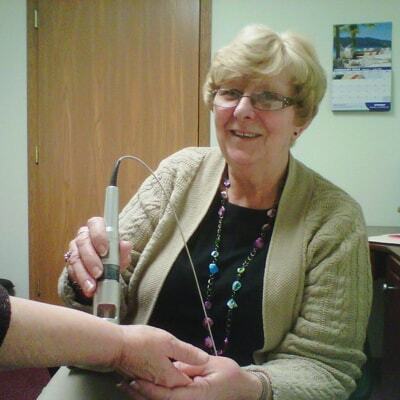 Sue Dyal is a certified laser therapy technician, using lasers to relieve pain. Sue used laser therapy herself to quit smoking and became interested in this treatment. She decided to attend schooling and started helping people with smoking and also revealed that patients reported the laser was helping to ease pain. Intrigued by the prospect of helping to manage pain, Sue went back to school to learn more about laser therapy and pain management. She was thrilled to learn the new techniques of lasers to relieve pain, as she has a grandson who has connective tissue disease and suffers with pain on a daily basis. Sue’s grandson suffers from several different diseases and at 16 years old, has used a multitude of narcotics to relieve pain and is now using laser therapy to help with pain management. Sue’s therapy works in conjunction with Chiropractic care, massage therapy, physical therapy, and medications. There are no side effects with laser therapy and reduced pain. Laser therapy helps conditions such as carpal tunnel syndrome, muscle strains, repetitive stress injuries, rheumatoid arthritis, fibromyalgia and is also a safe form of alternative medicine that does not use drugs or other chemicals. …or use the form below.